I almost bailed on this book. It was part of the haul that I found down the street from me (mainly the Pelecanos and Lehanes but a few sci-fis as well) and the one that I almost didn't take. It's pretty big (678 pages) and jumps right in to a ton of politics and names and I got lost quickly. I found myself annoyed at the nerdiness (it felt like it was written for the kind of audience that thrives on details that immerse in a setting rather than a human narrative). Fortunately, I had read everything else I brought with me (this was partially planned) and had to come back to it. I am glad I did. It does settle down into a very human, really fair to say deeply human story that while not totally satisfying at the end, takes the reader on a rich journey and makes you think a lot about family and the future of humanity. The story takes place in the distant future where earth has colonized the stars. There is now earth and and Alliance (which I think are the planets still allied with earth) and then the Union, which is a group that has gone farther out into space and separated in a war from the Alliance. The political capital of the Union is the planet Cyteen. 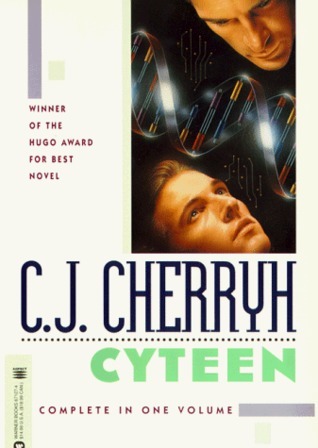 On Cyteen is also a super important institute, Reseune, who developed the cloning technology that has been crucial to humanity's colonization of the stars. The Union is divided into several different political representations (Military, Commerce, Citizens, Industry, etc.) of which Reseune basically controls Science. The politics are roughly competition between the Expansionists who want humanity to keep colonizing space and expanding and the Abolitionists who are against cloning and expansion and the Centrists. Reseune is led by Ariane Emory, a powerful, superior matriarch. Her advanced intelligence (technical, social and political) is demonstrated early on as well as her many enemies, including another brilliant scientist, Jordan Warrick and his son/clone Justin. Early on in the book, she is murdered. Her family and the political bloc that she represented decides to clone her and grow her replicate up in an environment as close as possible to the original one and her growth and relationship with Justin is the main part of the story for most of the book. See, it's a lot to explain and I am really glossing over it. The issues that come up are really interesting. Do you hate the child clone of the person who totally fucked you over as an adult? How does a clone react slowly learning about their genetic mirror image and predecessor? And what are the risks of a human society that can clone itself to make beings of various skill levels and psychological stabilities? Cherryh really thinks these things through in Cyteen and it's pretty fascinating stuff. It's also really gripping. You get caught up in it and the readers emotional responses to characters get thoroughly twisted around as you learn different aspects of well-detailed characters. It won the Hugo and I think it deserved it. Honestly, that I almost gave up on the book in the first twenty pages, I blame on the publisher. This edition had one really crappy map of the planet of Cyteen, which you don't even need. There are only two cities they visit anyways. What it needed was a political map and glossary, so you can quickly figure out who all the players are.